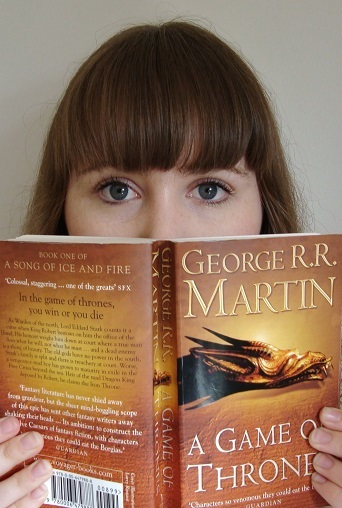 ‘A Game of Thrones – Book One – A Song of Ice and Fire’ – George R.R. Martin 1996. I have jumped on the ‘Game of Thrones‘ bandwagon very late for someone who considers herself an avid fantasy reader (Especially considering it has been around since 1996!). Somehow ‘A Song of Ice and Fire‘ slipped under my radar the past few years, and when I finally got around to reading the first book in the series over the Christmas break I couldn’t stop berating myself for not picking it up sooner. George R. R. Martin has a seriously impressive talent for weaving a web of political intrigue, and the writing skill to pull off an incredibly complex series of relationships without overwhelming readers. Martin’s setting for the series is very ambitious, more so than many standard works of fantasy fiction, but because of this a sense of place becomes integral to the development of many characters, relationships and conflicts. This is probably my shortest review to date, but I really was a bit overwhelmed by this book. I would recommend it for just about anyone, even people who are not normally interested in fantasy. ‘A Game of Thrones’ does not have a strong emphasis on many of the ‘traditional’ fantasy staples such as magic, which makes it a bit more accessible. ‘When you play a Game of Thrones, you win or you die’ is the catchphrase of the story and it is applied in a satisfyingly ruthless fashion. ‘The House of Silk: The New Sherlock Holmes Novel’ – Anthony Horowitz 2011. I’m only halfway through the first book of the series. Sheesh. Love the HBO adaptation, though I know the portrayals are not always accurate. Heard they made Stannis less moral and Daenerys more likable. Hey Patricia! Welcome to our (very much under construction) website! I must confess I’ve been a bit lax in my GoT reading/viewing but I really want to get back into it! I think even though the HBO series isn’t completely faithful to the books it manages to capture the spirit of the books very well. That being said I’ve heard mixed reviews now that the TV show timeline has passed the books… Still, got to get back into it. Thanks for dropping by!